I assigned a project for third year screenprinting students to create a print that investigates guilty pleasure. 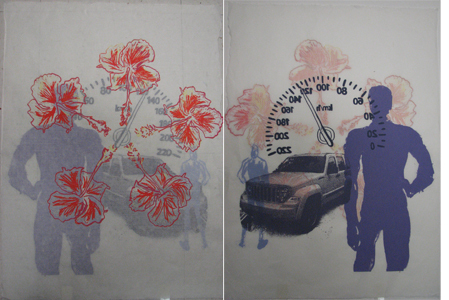 This print is executed by printing images on the front and back side of translucent rice paper. The guilty pleasure is both revealed and obscured by the veil of the rice paper. On the left is the print as viewed from the front. The image on the right is the print as it looks on the back side of the paper.